Named with impeccable logic, RateBeer allows you to, yes, rate your beer. Article over. Just kidding. The reason that we’re so keen to highlight this wonderful tool is that at Beer Hawk we use it all the time. Sometimes, but not always, to consider the beer we buy, but certainly many of us personally use it to rate beer ourselves but principally to research beer. What makes it so important is that it harnesses the intelligence and taste of the crowd. Breweries that make it onto the annual Top 100 list celebrate it with the fervour of an Oscar winner (usually). Beers that do well get attention, across the globe. The power of the crowd and the global distribution of users, plus sheer quantity members, also means that the smaller breweries are included. That one-off keg of experimental puff pastry rhubarb stout that was in your local tap room for about three hours. It’s probably on there. The essence of RateBeer is to give a beer a score out of 100. This score is aggregated through, in some cases, thousands and thousands of votes from RateBeer's community. There are some seriously complicated maths going on in the background (for me at least), but as a user you rate the beer through a combination of scales that are then divided into five-point ratings. There are weightings, averages and something called the Bayesian average that looks like this: (WR) = (v / (v+m)) * R + (m / (v+m)) * C. Whatever it does, it adds up to a score out of 100 that even I can understand. Another score alongside the beer’s overall quality is that of style and how closely beer ranks among its peers. The number of statistics that can be garnered from this information is staggering, and all easy to find on ratebeer.com. So what are the best beers? 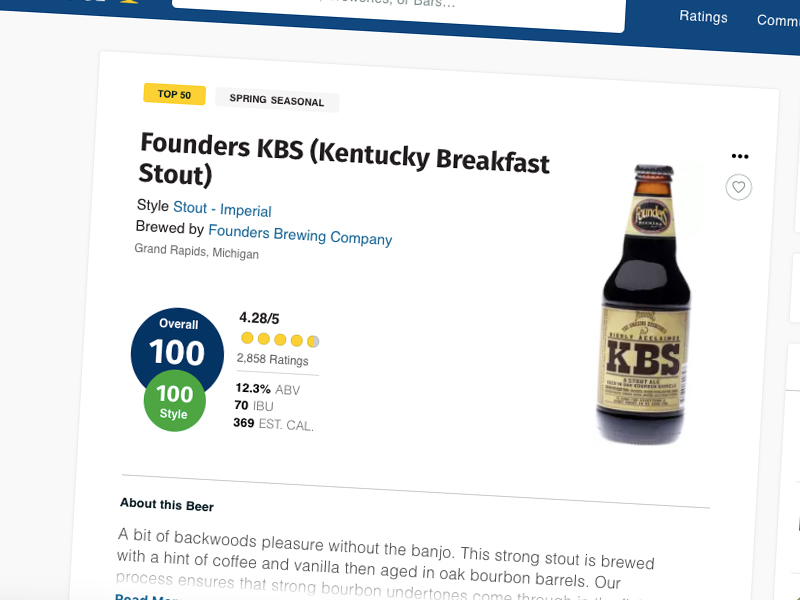 Well on November 8, 2018, the Top 50 beers included a lot of imperial stouts, including several stocked by Beer Hawk: Founders KBS and Goose Island Bourbon County Stout when it is released. And what about the Top 100 breweries? Well, we stock plenty of beers from this elite club: Founders Brewing Co, Siren Craft Beer, Magic Rock and Pohjala. You’ll also find a list of the worst beers in the world too. And, interestingly, the countries where very little is happening on RateBeer. So if you’re from American Samoa, Anguilla, Equatorial Guinea and Sint Maarten, find a beer and rate it! Any other country, and you’ll find someone also on RateBeer. And there lies the beauty of this crowd-source resource: It’s a community for beer lovers from around the world, it’s a place where we can all contribute to make beer better and, of course, hunt down the best beer in the world. I reckon you should sign up.